1996: At this time, leaving the serious part-songs behind, he starts to be interested in electronic music instead. In 2000 being a producer was a part of his life and, though with elementary equipment he only reached to elementary music, he devoted almost his whole life to this. 2002: Smaller parties were lost in the shadows of mega events and from the experience of this new atmosphere he took his first steps to the other side of the dj desk. After 2005 his work as a producer seemed to become mature and in proof of this famous performers started to spin his pieces such as dj Rush, Pet Duo, O.B.I., Sven Wittekind and others. His first released music was "I Will Be Your Dentist" which came to light in the seventh issue of the Destorted Records. Thanks to O.B.I it was possible for him to edit his first solo EP, as well, which had the title of Thirst For Irritation EP (Distorted 008). From now on he was unstoppable. 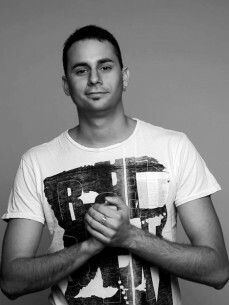 2008: One of the biggest agencies, namely the Artillery Booking Management lead by Dj Amok, was aware of his talent and besides, the Spanish 5 Minds Bookings Management signed an exclusive contract with him covering the whole Spanish region. Considering his performances, 2009 brought him the real breakthrough. By now, he played loads of different countries in Europe and in South America too. He traveled to Spain, Portugal, Netherlands, Belgium, Poland, Italy, Slovenia, Slovakia, Czech Republic, Austria, Ukraine, Germany, Bulgaria, Croatia and Brazil. In 2012 he also got his first Venezuelan tour and also in this year he also became a part of Criminal Booking management. He represented himself on many famous events, such as, NatureOne, Decibel Outdoor Festival, Djax It Up XL, SchranzTanz, Escalate, We Wish Techno, Footworxx, Hard Station, Elementz Festival or on the Spanish Montagood Festival where nearly 10000 electronic music fanatics were stepping equally to the beat filled with rumbling bass. Thanks to his singularly hard and special sounding, rows of labels (Mental Torments, Artillery, Animasola, Cannibal Society, Combat Skill, Cause, Domestic Violence and many more) asks for his music to publish. He remixed already for Dj Ocram, ViperXXL or O.B.I., over and above he collaborated with Pet Duo, Instigator, Sepromatiq and many more other artists. In 2014, he continued his path with Cubbo and since then, Svetec has been playing in the most renowned International Hard Techno clubs and festivals such as Montagood, Selvatek, CODE, Florida 135 and many more to come! Through the last few years he stood behind the same desk together with many techno and all the hard techno legends and he became a dominant figure of the hard techno sounding and scene.